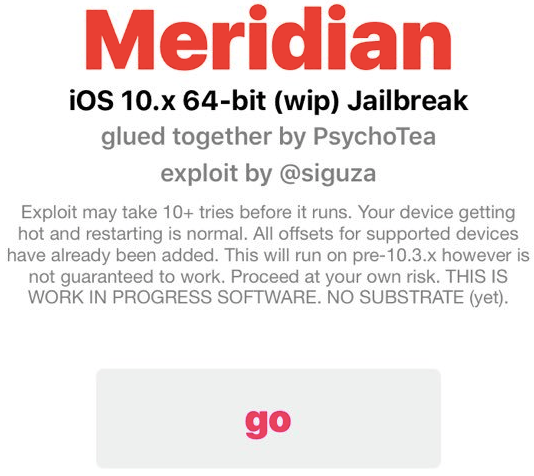 Meridian jailbreak ipa for iOS 10.3.3 is based on Siguza’s v0rtex exploit and Xerub’s KPPless exploit developed by, Ben Sparkles. Although this jailbreak is in early stages of development but you can use it and it also supports iPhone 7 and 7 Plus. If you are on iOS 11, then use LiberiOS jailbreak. iOS 10.3.3 has received quite a plenty of jailbreak exploits, upon them the newly released Meridian ipa is at your service. In this tutorial, you will find all the steps to jailbreak your iPhone or iPad on iOS 10.3.3 or iOS 10 via meridian jailbreak ipa. First you have to download the ipa file and then you can use cydia impactor to sideload this hack. Meridian is compatible with below iOS versions. Meridian iOS 10.3.3 jailbreak supports these phones. If you have any of the phones above, you can proceed with Meridian jailbreak ipa. Note: Jailbreaking your phone is an unofficial process. You should backup all the data via itunes before jailbreaking your device. Proceed at your own risk only. Make sure to backup all your important data including, contacts, media, apps and accounts. You have to do this process on PC or Mac. You should have a 64 bit phone. You can Download iOS 10/10.3.3 jailbreak and cydia impactor from below link. Follow these steps below to perfrom the procedure. First download Cydia impactor on your pc or mac. Then download g0blin ipa on your pc or mac. Connect your phone to computer. 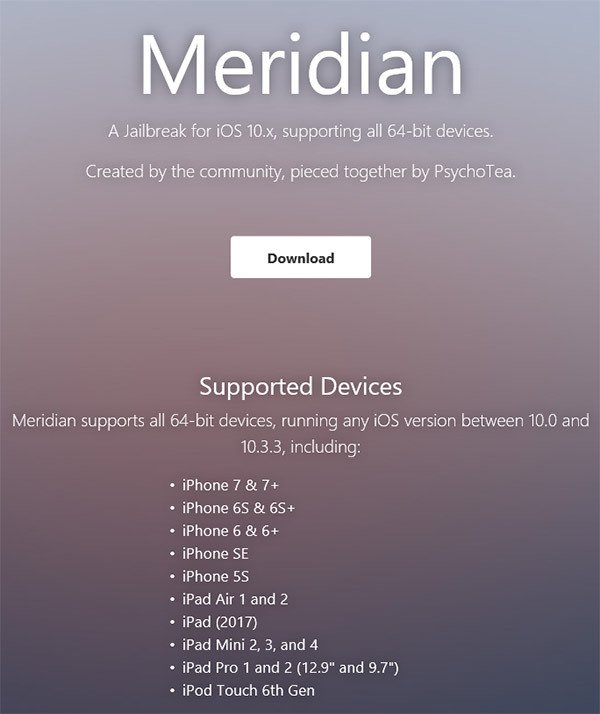 Now, click on your Meridian jailbreak ipa file and drag it onto cydia impactor. The ipa file will install on your phone now. Disconnect the phone when it installs completely. After that, go to Settings>>General>>Device Management and trust the profile of newly installed app. Now, launch meridian ipa jailbreak app that you just installed. Merdian will perfrom the jailbreak porcess. Your device will be jailbroken. That is it. You you no sucessfully jailbreak your iphone or ipad on iOS 10.3.3/10 using Meridian Jailbreak ipa. For any queries comment below.